A Bit of Sass: Lunchtime Poll: Socks and Sandals. Yay or Nay? It's cold out in San Francisco, and although I'm ready to bust out my sassy spring sandals, the weather tells me otherwise. In search for a solution to this fashion dilemma I zeroed in on an unfortunate (or perhaps not so) trend of pairing kicky little socks with designer sandals. Although I just don't think I could bring myself to wear socks and sandals loud and proud, I'm loving the way they've been styled on the streets by more daring fashion darlings. 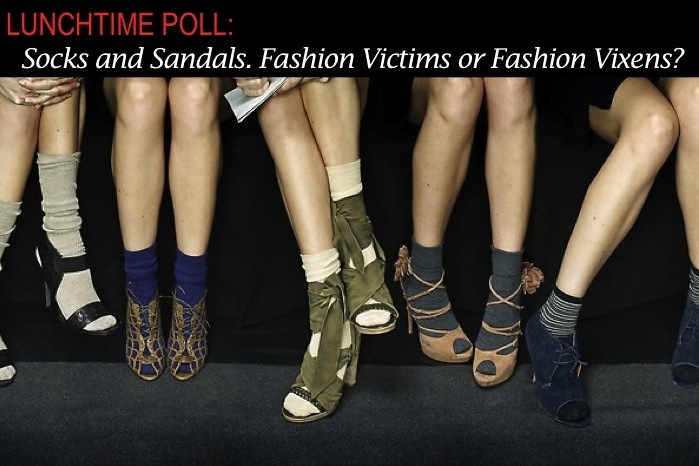 So, what's your take - Do socks and sandals make for fashion victims or fashion vixens? Before you make a snap decision check out some of the fun street styles below. And for a side note, I'm not going to include the picture of Sarah Jessica Parker gracing the web recently because let's just be real, her rendition of socks and sandals was fug nation. Sorry SJP! So now that you've seen plenty of socks and sandals gracing some uber fashionable feet, what's your opinion? Do you think socks and sandals are purely for fashion victims or do you think they are daring and cool enough to make a fashion vixen? I don't think its the poshest of all looks, but I will admit that in highschool (I went to a Catholic school and had to wear a uniform) there was a big trend of pairing the kilt with sock and Adidas flip flops. I definitely rocked that all the time. NOOOOOOO! I hate this one! Nottttt feeling it! I'm sure a few girls can pull it off in a cool way, but it's definitely not for me! Haha agree with Tiffany. This just makes me laugh because I think of when people used to wear socks with Adidas sandals. Totally takes a very special person to pull this look off and make it look fashionable. I'm not a huge fan of it, but I give anyone credit for pulling it off! This is my BIGGEST fashion pet peeve! I can't even describe how much I hate this. Vomit mania....too bad I don't have an opinion on this one. haha! I don't know what I think about this look. love this post! so classy and chic pics! It looks good in some of the pics...but it's not something I could pull off. I don't know if I could pull this off or not. Maybe I should try it. i think it is soo cute but i am sure i would end up looking like a homeless person.